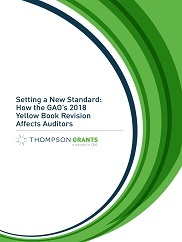 The Government Accountability Office (GAO) has recently issued a sweeping revision of the Government Auditing Standards (GAGAS), also known as the Yellow Book, which had remained unchanged since 2011. The Yellow book is used by auditors as a framework for conducting audits of public funds, including government entities, nonfederal entities that receive federal funds and other organizations performing Yellow Book audits. For an A-to-Z guide for administering or preparing for Single Audits, click here to learn about the Single Audit Information Service, part of the Thompson Grants Compliance Expert Compliance Library.